The month of March 1974 saw the return of a major star to the Mid-Atlantic area and the appearance of a notorious villain in the territory for the first time. The month also marked the end of a long standing venue in the area, and the formation of an impressive new tag team combination. Mid-Atlantic Heavyweight Champion Johnny Valentine continued to be a powerful force during the month of March. In the early days of March, Valentine had numerous Title defenses against Jerry Brisco. Other than a March 1st Title encounter at the State Fairgrounds in Richmond, Virginia where Valentine was disqualified, Johnny defeated Brisco in the remainder of their Title bouts during March. A particularly nasty bout between these two occurred on March 8th at the Fairgrounds in Richmond in a return match for the Mid-Atlantic Title. In this contest, Valentine thoroughly dominated his foe from Oklahoma in route to an impressive pinfall victory. This Title match also had significance for a completely different reason. As it turned out, this was the last wrestling match ever held at the Virginia State Fairgrounds at Strawberry Hill. For many, many years, the State Fairgrounds had been the almost exclusive venue for wrestling matches in Richmond. After this match, bouts in Richmond were held either at the Richmond Arena or at the Richmond Coliseum. Johnny Valentine abruptly ended the return of Jerry Brisco when he injured Jerry in a Title bout in Spartanburg, South Carolina on March 9th. Jerry had returned to the territory only a few weeks before. Brisco was hurt so badly in the Spartanburg contest, that the match had to be stopped during a Valentine onslaught when Brisco was unable to defend himself. For all intents and purposes, Jerry Brisco didn’t wrestle in the Mid-Atlantic area again for eight years after this brutal beating. 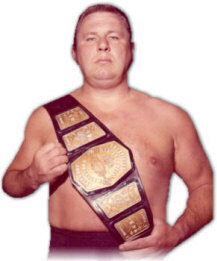 After dispensing the challenge of Brisco, Valentine had the bulk of his Title defenses in March against Johnny Weaver. The two “Johnny’s” had particularly grueling sets of Championship matches in Charlotte, North Carolina and Lynchburg, Virginia. In Lynchburg on March 15th, Valentine took the measure of Weaver via Count Out, and then in the return match the next week, defeated Weaver by Disqualification. In Charlotte on March 11th, Valentine received a rare victory by disqualification when Weaver struck the referee, though likely accidentally. The two came back to the Park Center in Charlotte the next week, with Valentine capturing a dominating win, even with Valentine’s huge rival Bearcat Wright as the Special Referee! Speaking of Bearcat Wright, the big man was continuing to have to fend off a $7,500 Bounty that Johnny Valentine put on his head soon after Bearcat arrived in the Mid-Atlantic area. According to Bearcat, the two had a previous history from other wrestling areas. Several clips from arena matches were shown on Mid-Atlantic Championship Wrestling television which showed Valentine unnecessarily punishing opponents after the bell had sounded, and Bearcat coming to the aid of his fallen comrades. One of the first wrestlers that went after Valentine’s “blood money” full bore was the rugged giant, Chuck O’Connor. On March 14th in the Greensboro Coliseum, Bearcat battled the money-hungry O’Connor in a Bounty Match. After a see-saw match, Wright finally subdued O’Connor with a series of vicious head butts. These types of rough Bounty Matches were what Bearcat would have to endure over the next several months. Mid-Atlantic Tag Team Champions Gene and Ole Anderson continued to hold onto their Championships with a vice-like grip during the month of March. In March, the Andersons defended their belts against a wide variety of opponents, that included teams made up of top flight competitors such as Bearcat Wright, Danny Miller, Sandy Scott, Johnny Weaver and Bob Bruggers. To show how heated Mid-Atlantic Tag Team Championship Matches involving the Andersons were during March of 1974, the Champions actually won two Title matches during the month when their good guy opponents were disqualified! On March 5th at the Dorton Arena in Raleigh, North Carolina, the normally stable duo of Bearcat Wright and Sandy Scott became so enraged with Gene and Ole that the challengers lost by disqualification. Likewise on March 9th in Spartanburg, South Carolina, Bob Bruggers lost his cool with the Anderson Brothers, got himself disqualified, and cost himself and teammate Johnny Weaver a chance at becoming the Mid-Atlantic Tag Team Champions. Yes, the Andersons could definitely get their opponents riled up! Returning to the Mid-Atlantic area as a regular for the first time in 1974 was “Number One” Paul Jones. Paul’s comeback match was on March 18th at the Park Center in Charlotte, and it was a successful return, against the wild man Brute Bernard. Upon his return to the territory, Paul also found himself a new tag team partner, the former Miami Dolphins linebacker Bob Bruggers. The Jones-Bruggers tandem made their debut in the Scope Exhibition Hall in Norfolk, Virginia on March 21st. And the first bout for this dynamic new team was a stiff test against the wily Bernard and massive Chuck O’Connor. Bruggers and Jones found a way to be victorious in their debut match, and this new team was turning their sights to the top of the mountain right away…the Mid-Atlantic Tag Team Champions Gene and Ole Anderson! The bad guy side of the talent ledger also got a big boost in the month of March when “The Russian Bear” Ivan Koloff entered the Mid-Atlantic area. The burly Russian was overpowering during his early days in the territory. Koloff’s first bout in the area was a dominating victory over the talented L.D. Lewis in the Lynchburg Armory in Lynchburg, Virginia on March 15th. Ivan stayed busy during the remainder of March, crushing a series of foes with his renowned “bear hug.” Among his other victims in March were Les Thatcher, Abe Jacobs and Scott Casey. Koloff looked to be a major handful for all of the good guys in the Mid-Atlantic area. Mid-Atlantic Television Champion Danny Miller maintained the hold on his new championship belt during the month of March. The master of the “chicken wing” hold was impressive throughout March, but Danny had limited defenses of his new Title, as the Mid-Atlantic Television Championship, still in its infancy, was experiencing a few growing pains. But Miller had a noteworthy, and successful, defense of his new Title against the always formidable Gene Anderson. The two battled over the TV Title in the main event of a card in Bedford, Virginia on March 27th. Danny took a beating in Bedford, but still walked out of the ring as the TV Champ! The bloody feud between Swede Hanson and the Destroyer continued to go on hot and heavy during the month of March. The two giants battled in a slew of specialty matches during the month. Swede and the Destroyer had hotly contested “Two Referees” matches in Richmond on March 1st, Roanoke, Virginia on March 2nd and in Greenville, South Carolina on March 18th. In all of these bouts, the big Swede was awarded the win because the Destroyer fled the ring and didn’t return. The two came back to Roanoke’s Starland Arena for a Return Match on March 16th in a “Chain Match,” which was a particularly violent encounter. The Destroyer had better results in “Lumberjack Matches” with Hanson that were held during March. In Columbia, South Carolina on March 19th, the Destroyer handed Swede a tough defeat after a spirited encounter. And in Richmond, with help from “lumberjack” Chuck O’Connor, the Destroyer posted a controversial win over Swede in a Lumberjack Match on March 15th. It seemed that throughout the month of March, the Destroyer and Chuck O’Connor were becoming quite chummy. In fact, they formed an impressive tag team. Their size alone was enough to give their opponents fits. But one of the most memorable matches of this new team during March of 1974 was actually a loss. On March 26th in Columbia, former adversaries Johnny Weaver and Swede Hanson teamed up against the Destroyer and O’Connor. Weaver and Hanson worked amazingly well together, and pulled out a victory over their massive foes to the delight of the huge crowd in attendance. March of 1974 will certainly be remembered for the continuation of the blistering hot feud between the Destroyer and Swede Hanson. 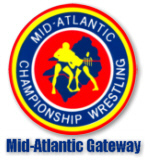 But the appearances of Paul Jones and Ivan Koloff during March assured fans of Mid-Atlantic Championship Wrestling that the talent level of the promotion would just keep getting better and better. The spring of 1974 was setting up to be off the charts in the Mid-Atlantic area! 1. JOHNNY VALENTINE --- The Mid-Atlantic Heavyweight Champion continued to be at his best during the month of March. It was pretty clear that someone was going to have to wrestle the match of their lives to unseat the Champ. 2. IVAN KOLOFF --- The “Mad Russian” burst on the scene in March of 1974, and was rolling over all of his opponents like a stampede. Koloff gave notice to all of the good guys in the Mid-Atlantic area that he was a force to be reckoned with. 3. PAUL JONES --- “Mr. Number One” returned to Jim Crockett Promotions in March, and appeared to pick up right where he left off. Paul functioned equally well in single and tag team competition. 1. JERRY BRISCO --- Jerry stayed in the area in the early part of the month, having little luck against rivals Johnny Valentine and the Destroyer. When injured in a match with Valentine early in March, Brisco immediately exited the territory and was gone for many years. 2. NELSON ROYAL --- Nelson was touring Japan for a good bit of the month of March, but he did return at the end of March. Royal was still effective upon his return, but slid down into more of a mid-card status. 3. JOHNNY WEAVER --- Much like his pal Nelson Royal, Weaver was effective during March, but was having more difficulty putting away the area’s toughest competitors, like the Destroyer and Johnny Valentine. Was Weaver just having an off month, or was March the start of a real decline for Johnny?